Are families patriarchal or matriarchal? 1. Decision making – this examines how power is gained through winning the argument/discussion over an issue. The person or group who win the argument gain all the power and can act on their decision. 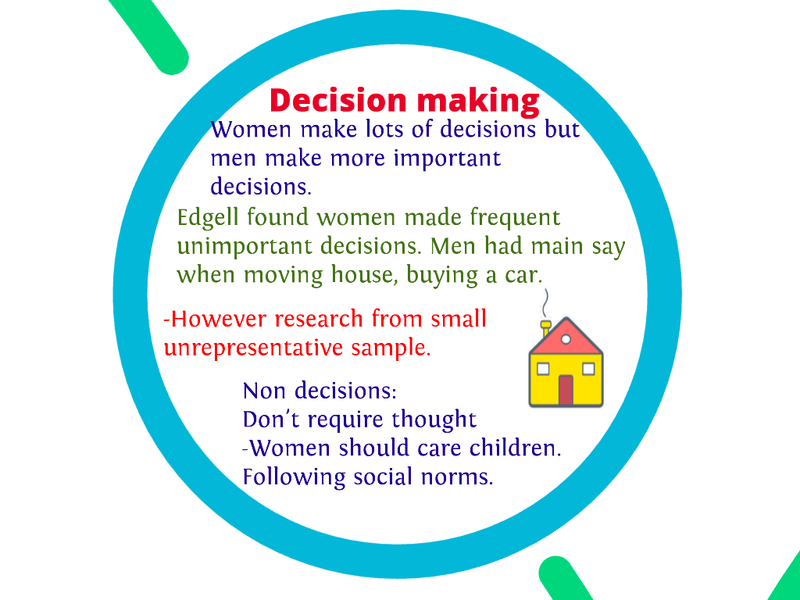 Edgell 1980 discovered was that only about half of the family decisions were taken jointly. The husband dominated the more important decisions like moving house, family finances, and buying a car. The more frequent and less ‘important’ decisions were left to the wife. These decisions tended to be about interior decorating, food management, and children’s clothes. 2. Agenda-setting (or non-decision making) – setting the agenda or non-decision making, some ideas about family life have already been made for people. Setting of the agenda is important in family life as those people who gain from setting the agenda hold more power. One example is where men’s jobs are largely seen as being more important that women’s. This transfers to the family whereby a husband’s power comes from his ‘superior job’ and can stop the discussion (agenda is set) of him cooking the evening meal because he’s worked all-day. Therefore because the wife/partner’s is seen to have a ‘lesser’ valued domestic role the agenda is set she’ll cook the meal. desires of people. This is known as Lukes’ third face of power. 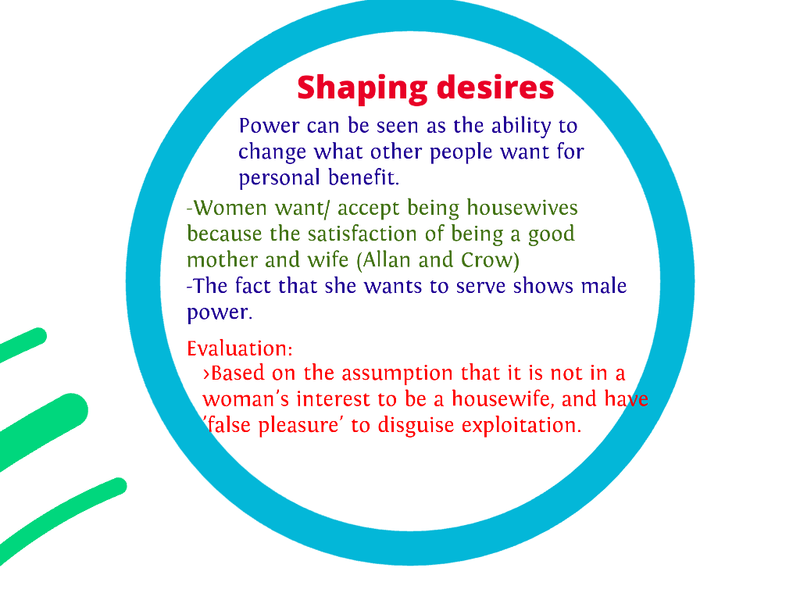 This form of power is more subtle than the previous two because it is about one group or individual shaping the wishes and desires of another group/individual without them realising they’re being manipulated as evident in the clip below. The idea with this view of power is the ability of one group to control another without them knowing it’s happening. This occurs in the family because women have grown to accept their subordinate status through Lukes’ third face of power. One ‘tool’ used to sell a woman’s subordinate status is through ideology. By cementing certain ideas into society as normal and inevitable women accept their subordinate role as carers and housewives because they’ve been ‘sold’ this idea. In general women don’t try and challenge these normal ‘biological’ ideas because if they do they’re seen as odd. The next page will allow us to apply each of the three faces of power to real family situations.